OK, maybe they’re not as commonly available as, say, tilapia, today. But clams are delicious, and they’re always fresh as can be so long as they’re live before you cook them. 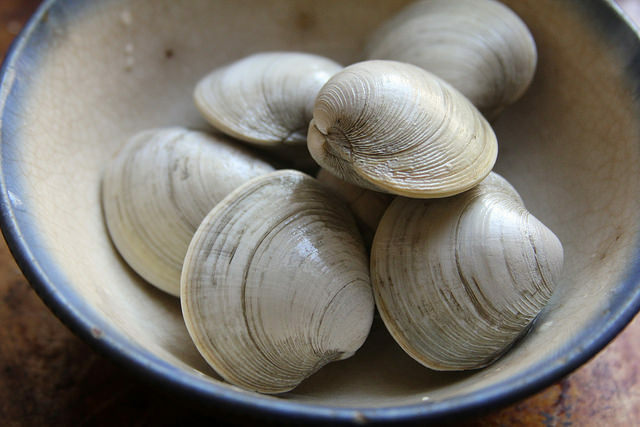 Freshly popped-open clams are exciting, juicy, briny and wonderful. So let’s cook them more often. And if you’re serving them with pasta, who says you can only have garlic, parsley, white wine and olive oil, too? I am a minimalist shopper so I curbed my enthusiasm and bought just eight clams and a bunch of fetching kale at the market recently. I think these eight clams are more than you’d typically get when you order a clam pasta (or pizza) at a restaurant. Get more—or less—to your bivalve’s satisfaction. It only takes a few to spread their flavorful juices throughout the entire dish you’re eating, though. Once they had just barely popped open—and this is a dramatic moment that is quite hard to miss, sort of like the moment when a romantic comedy actor leans in for a kiss—you can add the kale. Just let it wilt a little, a few seconds and not much stirring. Then you can throw in some al-dente cooked pasta (thick, long strands of spaghetti or linguine are a nice way to reacquaint yourself with the classic). And for a little crunchy finish, I tossed in some breadcrumbs that were toasted in olive oil. ‘Cause why not? It’s a combination of the pantry (or stale and leftover) basics and a couple fresh things that really sing. I may have been inspired by Sara Jenkins on my latest episode of Eat Your Words to throw together a pasta like this, but there’s no reason this can’t be done on any given day or season, too. 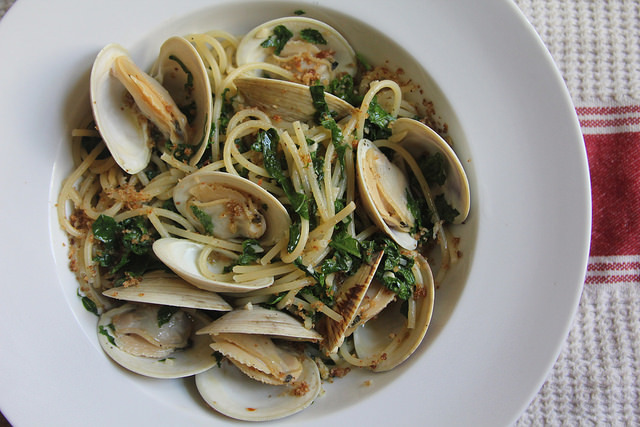 Like dried pasta, clams are a staple, all-season virtue. So let’s enjoy them both more. Rinse and scrub clams under cold water. 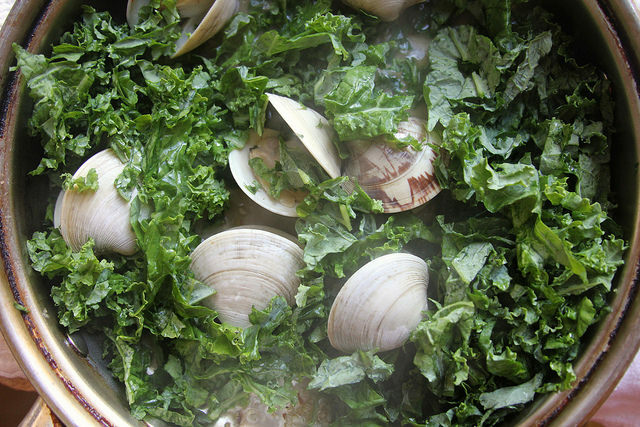 Soak the clams in cold water and set aside. 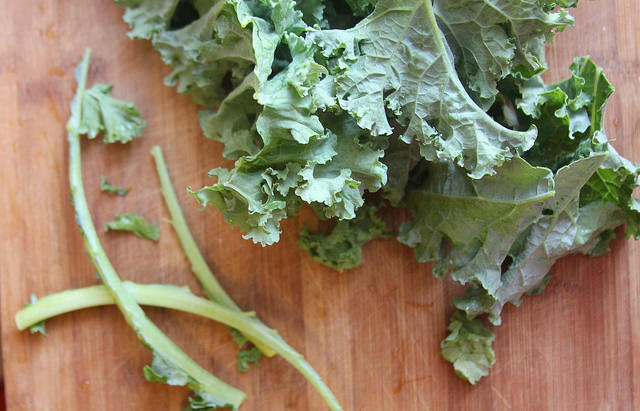 Remove the thick stems by holding each leaf from the stem and stripping the greens away. Finely slice the kale and set aside. Heat 1 tablespoon of the oil in a saucepan and add the fresh breadcrumbs along with a pinch of salt and pepper. Stir to coat evenly and remove from pan once the breadcrumbs begin to smell toasty (about 1-2 minutes). Set aside. Cook the pasta according to the directions on the package until al dente. Drain, retaining 1/2 cup of the cooking liquid. 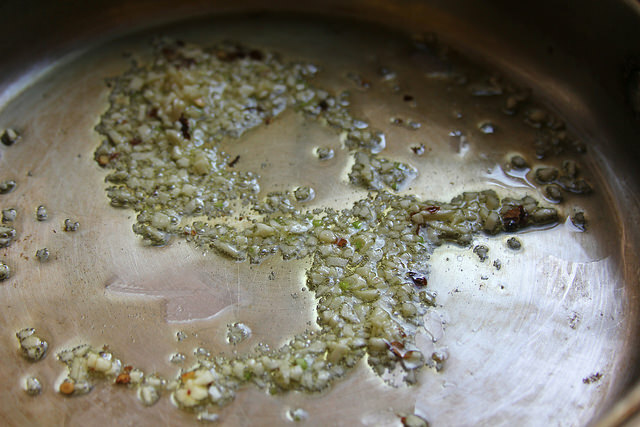 Heat the remaining tablespoon of olive oil in a clean saucepan that has a lid and add the garlic. Once it becomes fragrant, add the chilies and let sizzle another few seconds. Add the white wine and increase heat to high to bring it to a boil. Add the drained clams and cover the pan. Let cook for 3-4 minutes before peeking; if most of the clams have opened up, continue. If not, cover and wait another minute before peeking again. Stir in the kale leaves and a pinch of salt and pepper. Cook, stirring, until the kale is mostly wilted, about 1-2 minutes. Stir in the cooked pasta and its 1/2 cup of cooking liquid. Add the butter or extra tablespoon of olive oil and season with salt and pepper to taste. Remove from the pan and serve immediately with the breadcrumbs sprinkled on top. Four brownie points: A clutch of fresh kale goes a long way to fortifying this dish with healthy vitamins and antioxidants that will help keep winter colds at bay. Clams, like most seafood including shellfish, deliver a healthy dose of omega-3 fatty acids to help keep your cholesterol levels at bay. They also provide vitamins and minerals such as Vitamin B12, selenium, iron and—yes—protein. 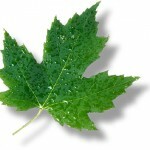 Seven maple leaves: You can easily rely on pantry during the winter months, using dried pasta and spices and herbs. 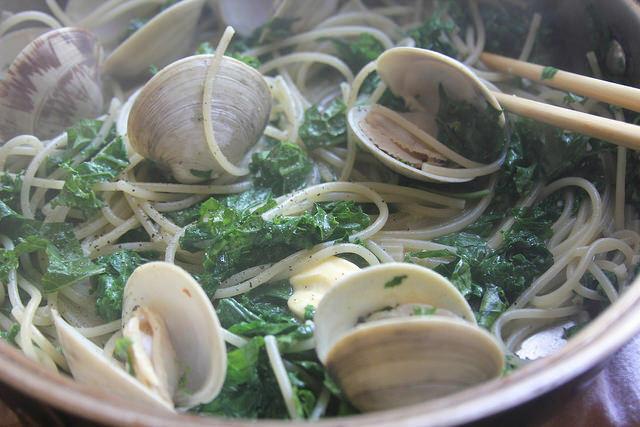 Along with them, a few fresh ingredients like these local clams (which are plentiful near almost any shore) and the few vegetables that are around, like late-season kale. 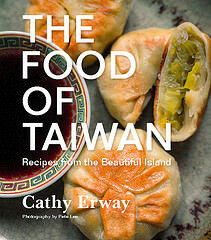 I just discovered your blog and will have to try so many dishes. Love your sensibility and writing style.